I, for one, am running out of patience for charting this market's short-term congestion, so I'm considering quitting futures trading and taking up a new career in a more exciting and action-packed field, like stamp collecting. With the exception of the brief (and anticipated) head-fake to 1426, the S&P 500 (SPX) has traded in a 20 point range for four weeks now. Fed Doublespeak Friday created the expected volatility (and then some), but accomplished nothing productive in terms of price (or in terms of Bernanke's talking points, for that matter). We're still in a no-man's-land price zone, and while my preferred outlook ultimately anticipates lower prices, the bears haven't yet claimed any levels to add confidence to that view. 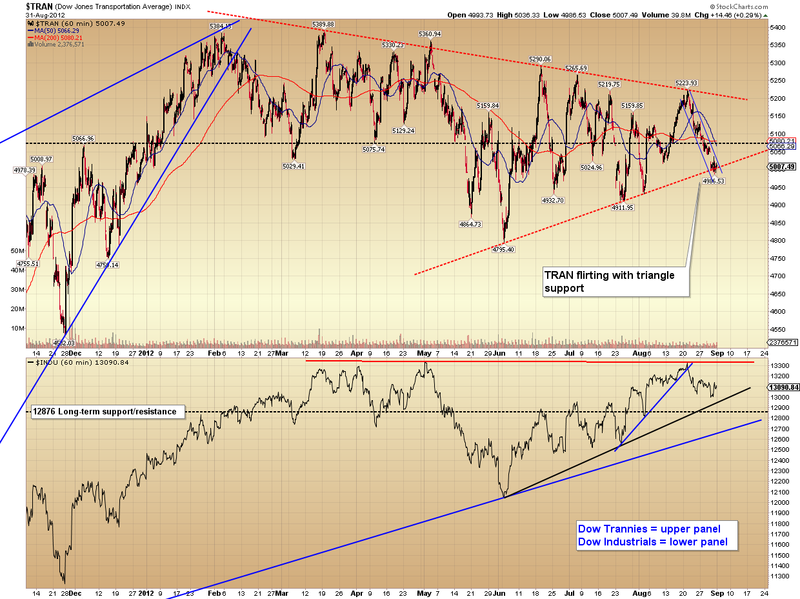 Chart-wise, I'm going to start off with the very big picture view of the SPX. The black channel was created by connecting the 2002 and 2009 lows and then placing a parallel copy of the trendline at the 2007 high. The market has reached the zone where the fractal could be complete, and I still lean toward the view that it is complete -- but as yet there's no way to definitively rule out the possibility of a run toward the upper red trendline (in the mid-1400's). 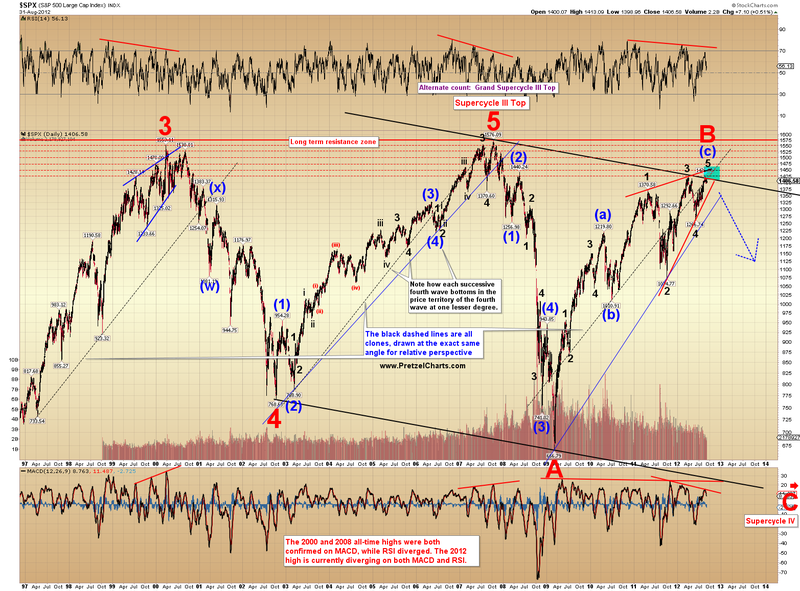 The big picture expectation is that the cyclical bull market is nearing an end. As an aside, note the comparison of daily MACD readings in the bottom panel. 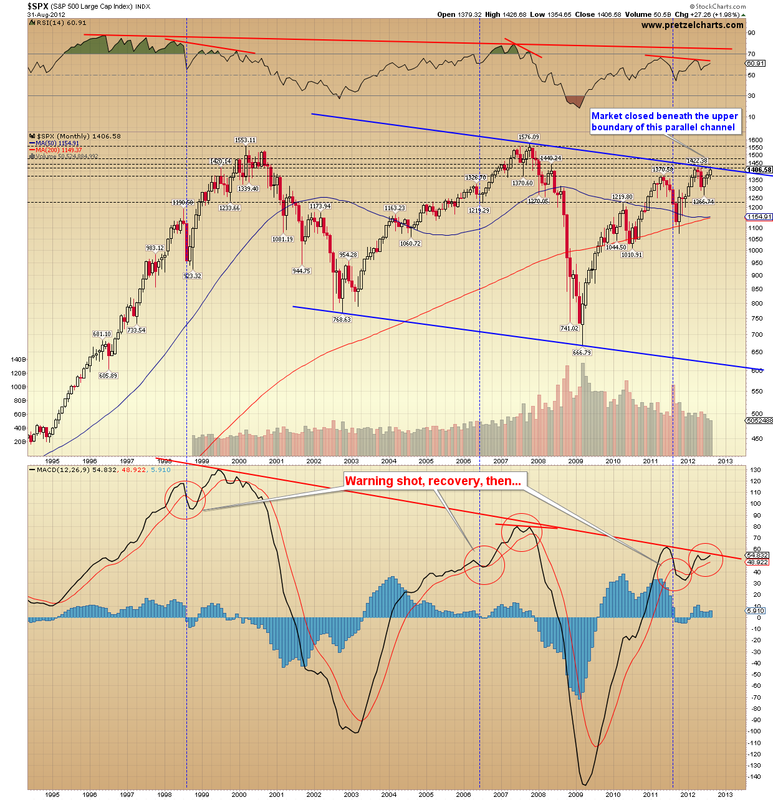 The next chart is an SPX monthly chart, and focusses on an interesting pattern in the monthly MACD readings. 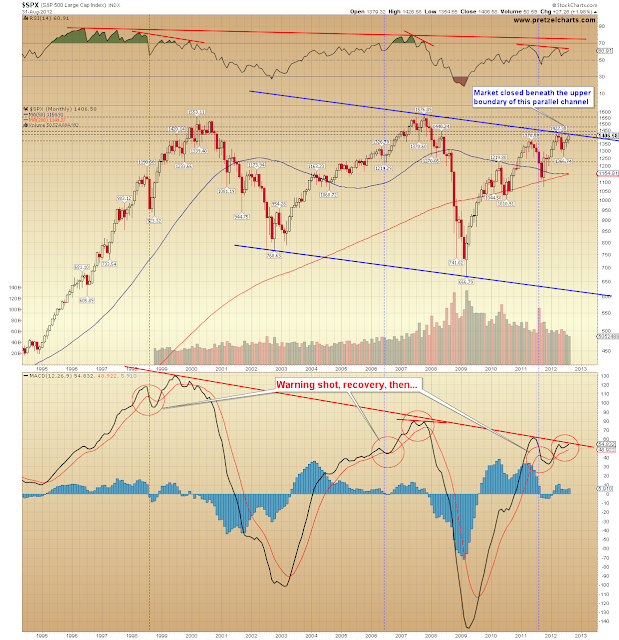 Incidentally, the NYSE Composite (NYA) monthly MACD sell signal did persist into September, as I mentioned was likely in the last update. This chart does argue that the bulls' days are numbered. 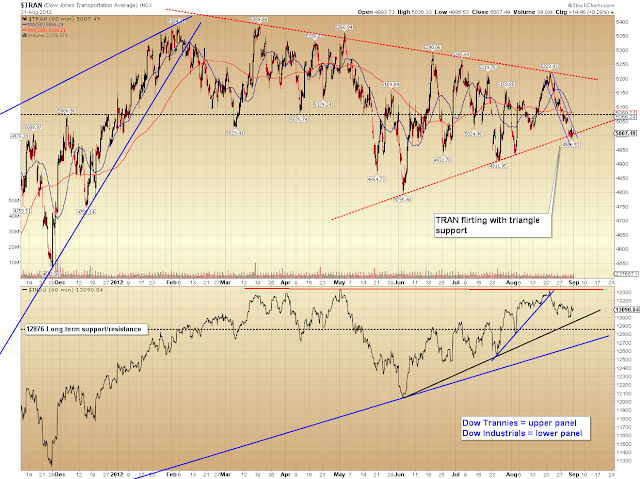 Next is a look at the Dow Transportation Average (TRAN), which is wrestling with support at the lower triangle boundary. 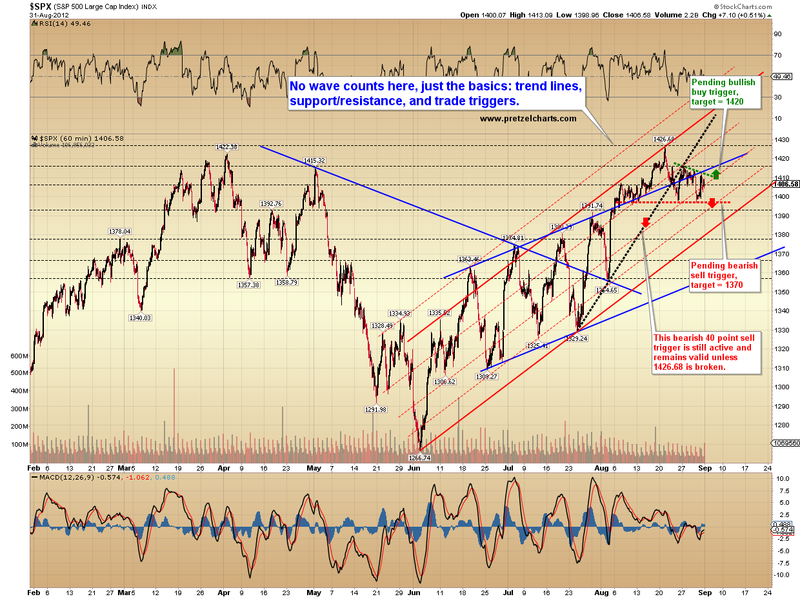 For comparison, the Dow Industrials (INDU) is shown in the lower panel. The SPX 30-minute chart remained essentially unchanged for the entire month of August. 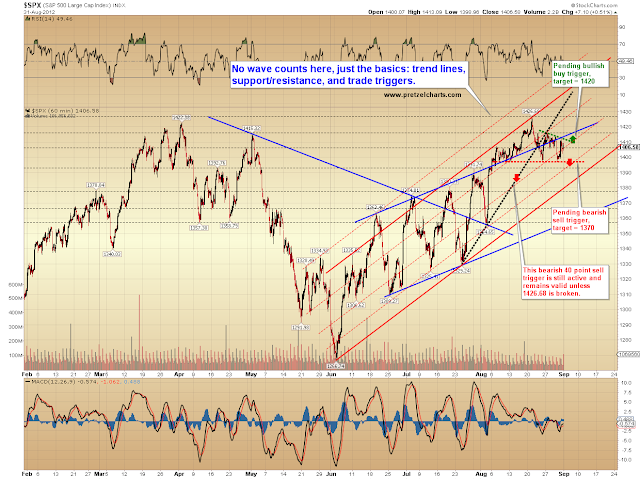 As boring as the market was, it followed the projected outlook very well. My expectation is still that an intermediate trend change is underway, but the very short-term charts are open to a lot of different interpretations. Sometimes I can look at a one-minute chart and call every little turn in advance for hours on end -- other days, I have no clue what the market is going to do next, and have to wait for it to "prove" itself. The fact is, there's no system that allows us to know the market's every move in advance (and if there was, nobody would share it!). It's important to know when a system is vulnerable to noise, and this is one of those times. Elliott Wave just doesn't provide a clear direction for Tuesday from the current pattern, so the next chart is pure classic technical analysis; which might be more useful (and more realistic) than trying to label the market's every little squiggle at this stage. Based on the larger view, I believe this will resolve lower; but I'm uncertain if that will be immediate or will come after a retest of the high. 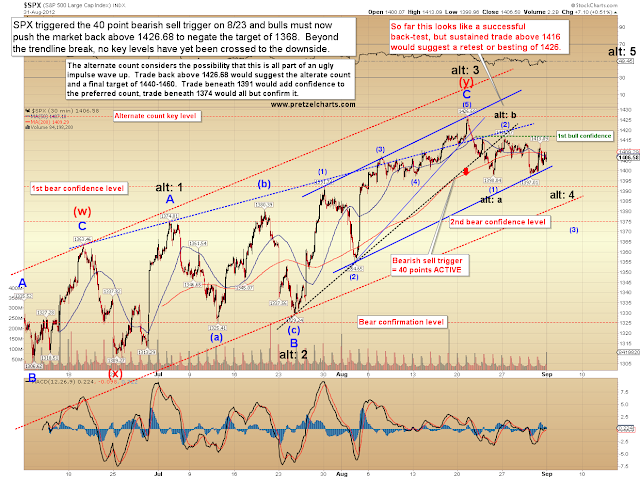 In conclusion, the market gave a host of top signals in conjunction with the expected turn at 1426; so I'm sticking to my guns for the time being on my preferred view that "the top is in." To be fair, the decline thus far has been ambiguous, and hasn't added any confidence to that view -- but it hasn't done anything to detract from it either. In my last update, I warned that the market was in a zone where it could bottom and reverse -- however, the rally on Friday was overlapping and looked corrective, which suggests that this isn't yet a meaningful bottom. So far, it still looks more like a top. Trade safe.